I want to wish a Merry Christmas to everyone reading this blog! The most valuable institution in our life is our family. This is why I dedicate this entry to my family and its history that nothing will be forgotten and the history can be passed on. I want to wish a Merry Christmas to everyone reading this blog – or in German Frohe Weihnachten! The most valuable institution in our life is our family. This is why I dedicate this entry to my family and its history! Merry Christmas to all of you who follow the entries on BeNicoMa.com and many thanks for your support, I am glad to have you here and wish you peaceful Christmas holidays! Many conflicts divide our society, the different peoples of the world and the family as an institution suffer from restrictions, which are caused by our economic interests and the pressure, built up by our society… This should not be the case since the family is the only institution in life, that is not exchangeable and if you are peaceful and in harmony with the ones you are related to, everything is so much better. The inner family on a glance: Madga with Teh Wei on her lap, besides my father Teh Li, Teh Dscheng (Ted), Teh Ko and Teh Hsing – from left to right. In the back is my grandfather Ting Sheng. The picture is from 1944 or 1945, and was taken in Germany. The name of my grandmother, Chao Ti Ling (that is her maiden name) and later Ma, means as much as “Call me the little brother” since Madga (mother) as we used to call her, was born into the Chinese part of my family solely with sisters. The name implies the wish for a son. 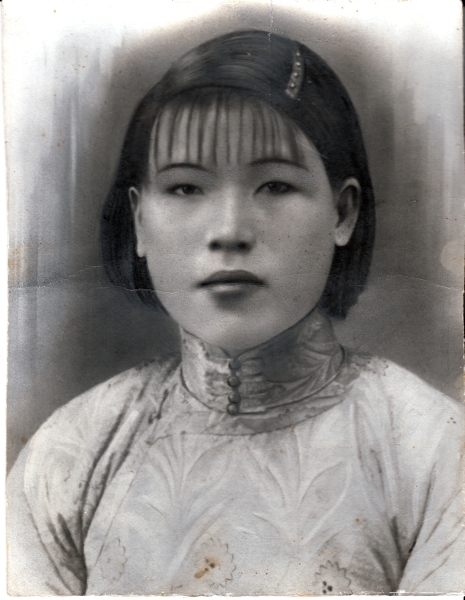 She was from Wenzhou in China and was born in 1916. Chao Ti Ling, with 16 years in China – We just called her Madga. For what she achieved in those tough times, she is one of my alltime idols, may she rest in peace! My grandfather Ting Sheng Ma was merchant and much older than her. He was born in 1898 in the region Chekiang (Zhejiang) in China but I couldn’t get more detailed information about him from my uncle. Here you see some pictures of family members from China but my uncle Teh Ko couldn’t provide more information about them since he doesn’t know better. The pictures are all what is left as a connect to the Chinese background of the family in China and albeit from him, nobody speaks Chinese anymore, which is a pity. I use the Chinese letter for Ma as signum for my photography and in future I will apply it as a seal in all official purposes. Our last name Ma is written like depicted here and the meaning is “Hemp plant under the firmament“, if you translate it into a western meaning. The name is rare in the meanwhile, since most Ma‘s are derived from the meaning horse. We don’t know much about our family background in China. My grandparents came alone in 1933, when my grandmother was 17 years old. They came with the Transsiberian train, via Russia, to Dingen in Poland as their first home in Europe. I could not find the Polish name for it nowadays but have the names of the other cities where my family lived in those times. They moved several times in between Germany and Poland. All my uncles were born in Europe. My grandparents moved from their first destination Dingen to Łódź – which was called Litzmannstadt by that time. In Łódź, which belongs to Poland again after the end of WWII, my uncles Teh Ko (1935) and Teh Hsing (1937) were born. Most of the provided information was given to me by Teh Ko, who remembers lots of details, despite his age. Teh Tscheng (1939) – who was just called Ted later, because he moved to Canada to found his own family – was born in Poland as well. The family wanted to return to China in 1939 due to the ongoing and developing war on the countryside in the East. My grandfather was quite successful with trading by that time but the Germans took everything, which made their return impossible. A relatively big Chinese community lived in the Łódź area and many of them returned to China if somehow possible. In 1939/40 the family moved to Berlin. Their first home in Berlin was in Wallner Theaterstrasse 26, in district C2 in 1940. My father Teh Li was born in Charité in 1942. In the winter of 1942/43 the bombings of Berlin started and Teh Ko remembers that they have been heavy. He remembers that the windows were clotted and covered with paper everywhere to prevent the breaking glass, due to the bombings, from scattering as dangerous slivers. He also remembers, that he was once hit at the leg by a shrapnel while leaving the bunker. In general he reports that they had relatively few problems with the Nazis. The only thing he mentioned was, that my grandfather should get retracted by the Nazis to fight for the Wehrmacht in 1942/43 – In contrast my father and my Canadian cousin Oliver claim, that my grandfather was forced to leave for compulsory labor in a camp but Madga prevented his vitiation by arguing with the Nazis how she should be able to feed and raise four boys without a father, that’s what she said herself. Maybe the truth is somewhere in between… It will be tough to reproduce the true happenings. Due to the massive bombings families with many children were evacuated to the countryside – as Teh Ko states on a tractor – in the year 1944 and in a measure called “Storch“. They were moved to Dahlhausen in Brandenburg, about 110 km North-East of Berlin, close to Wittstock / Dosse, and lived initially in the house of Pastor Schmidt in the year of 1944. They were looted again, this time of the Russian red army, although the grandfather had buried everything. On the countryside they were shifted several times and in the same year 1944 my youngest uncle Teh Wei was born in Kutno, which was called Schröttersburg by that time and was part of Schlesien, but belongs to Poland again today. On this picture are Teh Hsing, Teh Tscheng, Teh Li, Madga and Teh Ko from left to right and some unknown friends of the family. After the war in 1945/46 the family returned to Berlin and lived in the Auguste-Viktoria-Strasse in Berlin-Grunewald. The children received Chinese lessons from their private teacher Gau Guan Shi. My grandfather didn’t return with the family, he traded with slippers in Poznan (Posen) of Poland, where he lived and worked in Loketka 26 to support the family, and while in Berlin, he carried luggage and traded carpets and china porcelain together with Teh Ko. The both were hawking, traded in the streets and in restaurants, my grandmother took care of the children by that time and the family did alright – both, my uncle and my father confirmed that, independently from each other. If anyone can and wants to contribute to add to the puzzle of family history, please contact me via my contact form. The attached gallery shows different members of the family and the names and relations to me are given as far as I know. The idea and task to create this entry was granted to me by my cousins Oliver Ma from Canada. I met him, his sister Stephani Ma, and my little cousins Savanna and Etienne, his kids for the first time (that I remember) in 2013, during my Eastcoast Roadtrip. An awesome experience and we will see each other again! I wish happy Christmas Holidays to everyone and hope to be able to gather some more info during the time. Take care!